Last week (Wednesday, August 3) I attended Intertech's 25th Anniversary Peculiarly, two of my coworkers were there as were their wives. The Twin Cities tech industry is mighty small. I asked Sanjay if one of the two women at the end of the row in the rather short skirts was his wife and he laughed because his wife told him about the two women I was asking about. In my defense, they looked like interns (young), so I was wondering exactly how young Sanjay's wife was. Presentations included Jim Karg on IoT. Lonnie Weaver-Johnson on Organization Benefits from Agile and Scrum Adoption. And Tom Salonek, who runs Intertech, on Delivering High Performance Using Employee Engagement. There was a little bit of good information in each presentation, although they were at a higher level then I tend to like. 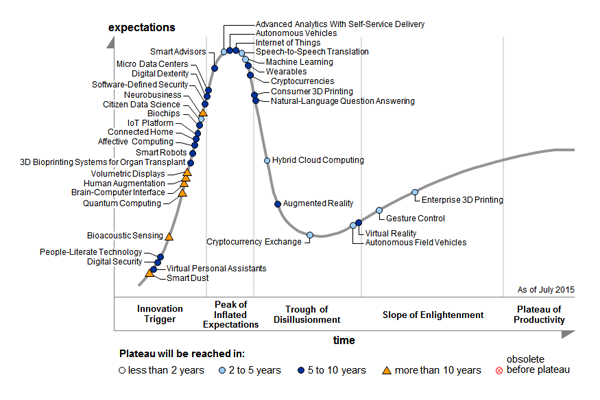 Jim referred to the Gartner 2015 Hype Cycle, which I always forget exists. It worries me that hybrid cloud computing and machine learning are over the hump given thsoe are spaces I'm working in lately. Those others things - I'm not even close to worrying about them. It was a good presentation on battery tracking in golf carts. I wasn't quite sure how you get enough golf carts under IoT to make it worthwhile, but perhaps golf cart purchasing/selling or storage is more centralized than I understand. Weaver-Johnson was pretty basic Agile/Scrum. We've been Agile-ish for going on 3+ years with Hussman's help, so it's old hat, even if we're constantly refining our process. Amusingly, I had a group that went back to our old testing-signs-off-on-stories process despite quality having had a more free reign on one of my teams. All stories, even 0 points/days get a quality review/signoff and estimate. Maybe that's more agile. It's hard to say. But I know the team likes it and is more efficient using the process and they talk more, so those better communication chains are what really matter. Weaver-Johnson referred to the Cuckoo Effect. It's a variation on our culture training where we're taught to look for how to make something work, not what's wrong with the idea. I don't think it's a good metaphor - because when cuckoos invade your nest, there's a positive side, baby cuckoo birds. I liked Salonek's presentation best. He has a new book, The 100: Building Blocks for Business Leadership. I haven't read it yet because I'm knee deep in: Analytics, a Foundation Novel I started on RAGBRAI, a Saunders book I took to RAGBRAI but haven't finished, the end of Disrupted, and Elastic, Angular2, Python, D3, AWS, Eureka, and Spinnaker documentation. And a little bit of ANTLR and other nonsense. It's queued up. I'll get there very soon. He talked quite a bit about culture fit for new hires. Intertech does a lot of screening and looks at Key Result Areas (very specific goals) and TTI Success Insights (DISC based - you know my opinion on those sorts of things - they're talking tools, not science), Tom noted that as far as pay was concerned, aim for slightly above market and make sure pay isn't an issue. That's exactly what Dan Pink says in Drive. It's all the more compelling given I just had another employee leave to do contracting. Enjoyable. I'm glad I stayed for the presentations and free beer and I won 4-5 days of training at Intertech while I was there which I'm jazzed about. I can't decide if I'm more interested in Angular 2 or .NET Core. I think .NET core, although the description still says there's a focus on MVC which bores me to tears. Well...not quite tears. But I don't want to learn more MVC.